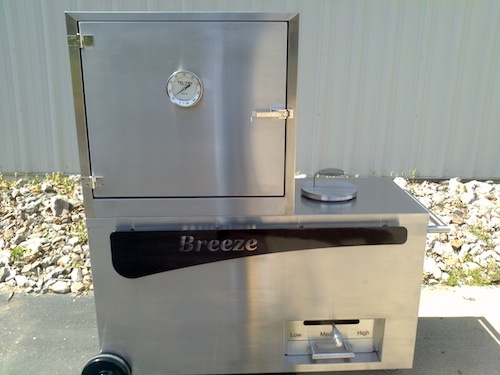 One of the features of the Breeze is how well it is insulated to keep the oven temperature constant. 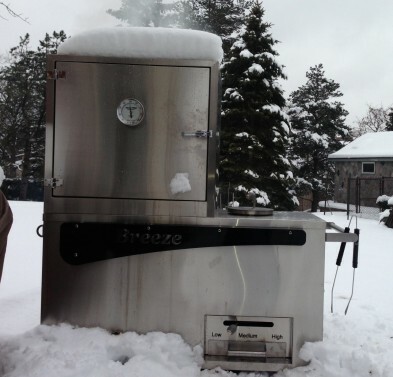 A snowstorm named Nemo gave one of our customers a chance to demonstrate just how well insulated. Check out these pictures of the Breeze chugging away happily at 250 F, and after four hours of cooking, the snow still sitting on top of the unit… including a patch stuck to the front of the oven. Happy Holidays to everyone in BBQ land! We here at Tremore Breeze wish you and your loved ones a prosperous and delicious new year. Max Good of AmazingRibs.com requested Nathan’s rub recipe and his technique in smoking ribs with the Breeze. I thought I’d share his response to him. We hope you enjoy it! Here’s my rub recipe and my overall rib smoking technique. I put all of the above in a burr coffee grinder and grind on a fine setting. After grinding I toss in a bowl to make sure its all mixed. Grinding gets all the ingredients to be the same size so they stay more uniform when I put them on the meat and also finer powders are more flavorful on the tongue. For the ribs, I start with either baby back or spare ribs. I remove the silver skin from the back and trim the meat of any excess fat. Even though the fat renders well when I cook the ribs, no one likes to bite into a glob of fat. I use a shaker to evenly apply the rub to the front and back of the ribs, and then let them set out for 45 min to an hour to come up to room temperature. Also during this time the salt draws out the water, which in turn dissolves the sugar…all before going in the Breeze. For the Breeze, I cook ribs with a combination of 50% hickory chunks and 50% lump charcoal. 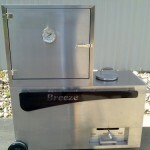 I light the Breeze and bring the temperature up to 250F. I put the ribs in and cook them at 240-250F for 3.5 – 4 hours. I never touch the ribs during cooking and I never wrap them. I close the door and walk away. At about 4 hours they are close to being fall off the bone tender. I pull them and let them sit for 10-15 min before cutting. This is exactly how the ribs you tasted were prepared. I hope you get a chance to enjoy this recipe again soon! The Breeze reviewed on About.com! Hello all, we’ve had many questions about the portability of the Breeze. You can’t see from the picture on the front page, but the Breeze does have 4 total wheels (2 large ones you can see, and two smaller ones underneath the unit). The front wheels, like everything else on the Breeze, are high quality. The wheels allow the Breeze to be maneuvered by one person despite weighing 500 pounds. If you plan on using the Breeze in your backyard most of the time, or are maneuvering it on paved surfaces, these wheels will be more than adequate. We’ve brought the Breeze to two or three cooks where we set up on the grass with no issues, and we’ve only used the units with the smaller wheels. For those of you using the Breeze in “off-road” situation, we now have a larger wheel kit available. These wheels, which will be the same size as the rear wheels, will attach to the front of the unit. This kit is available for $299. So don’t worry, we still have our Amazing Ribs gold medal! It’s a great website, please check it out if you’re looking for smoker and/or grill reviews. And check out our great review here (scroll down to the “T” section). Hello all, we’ve gotten some feedback from our customers and I wanted to share them with you. The design of the Breeze circulates air throughout the cooking chamber, which gives the cooking chamber the effect of a convection oven, keeping temperature consistent throughout. 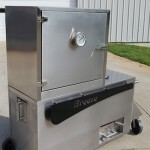 However, if you use the very bottom rack of the unit, it is right above the drip pan, which also deflects incoming heat/smoke so it circulates throughout the oven. 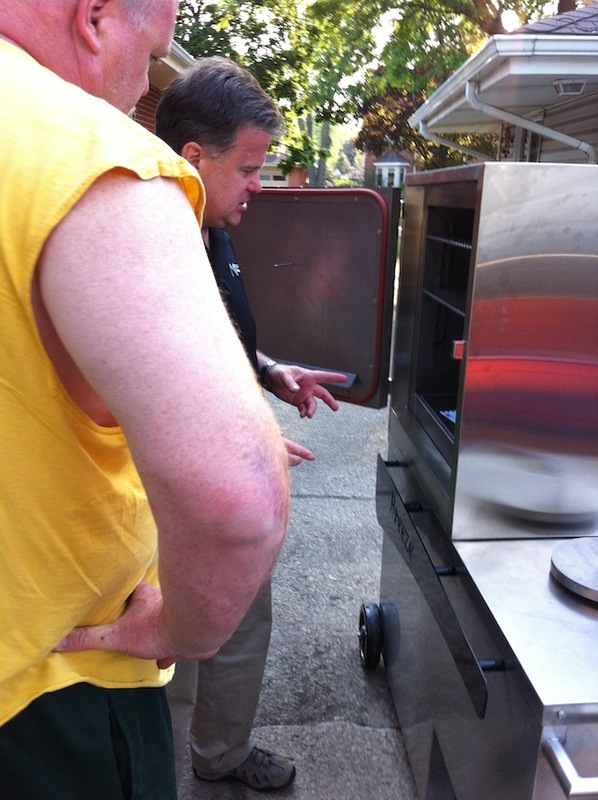 The drip pan gets hot, which then in turn can heat up the air immediately above it. So you will have hotter air if you use the very bottom rack of the unit. The air everywhere else heats up very evenly. 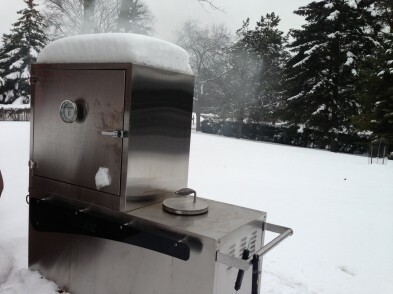 We’ll use the bottom rack to put the thicker racks of ribs. We’ll also use the bottom rack of meats when we’re sampling to see if the meat is done… it gives you a sneak peek at what the other racks of meat are doing. Nashville, Huntsville, Chattanooga, Knoxville – Anyone around? 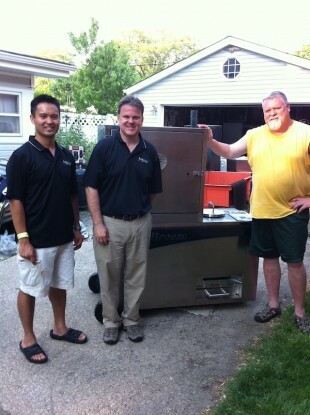 We GAVE AWAY a Breeze in Westmont! 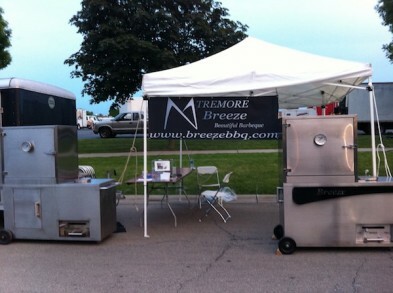 The Tremore Breeze team had a great time sponsoring the Westmont Red White and BBQ competition over Memorial Day Weekend! It was great to meet all the teams and Nathan got a chance to talk about his baby all weekend long to people who really knew BBQ! 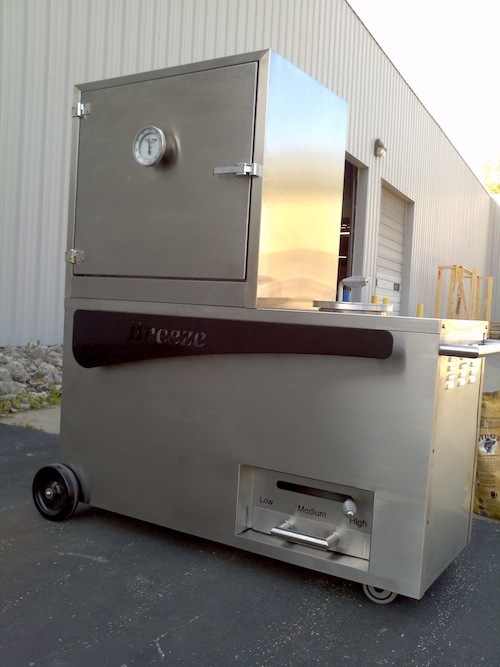 And our lucky winner of a brand spankin’ new Tremore Breeze Smoker was Dan from Hog and Hoss! Thanks to Chris Svitak of Westmont Red, White, and BBQ and all of the teams who competed! 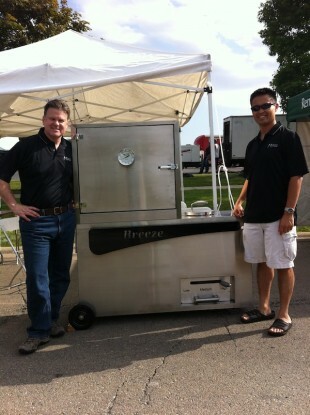 And thanks to all who stopped by to take a look at the Breeze up close. We enjoyed talking with you and had a blast! Hope to see you call again. 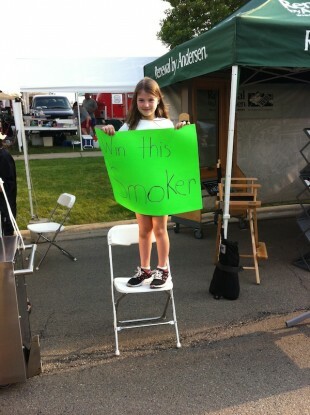 Come see us in Westmont Illinois this weekend! We’re getting geared up for our trip to the Chicago suburbs this Memorial Day weekend! We’ll be displaying and demo-ing the Breeze at the Westmont Red, White, and BBQ competition. 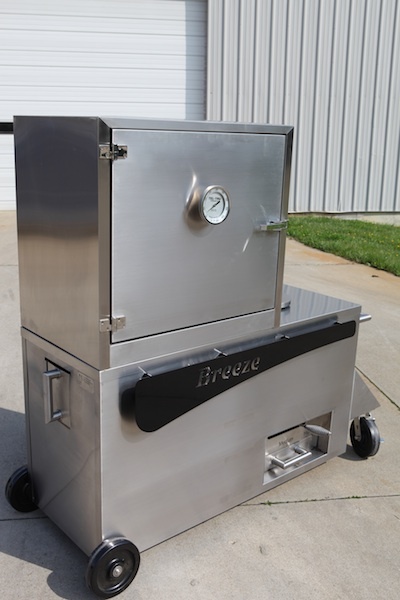 Also, one lucky team will go home with a brand new Tremore Breeze smoker! If you’re in the area, please come by and check us out! We’d love to see you! 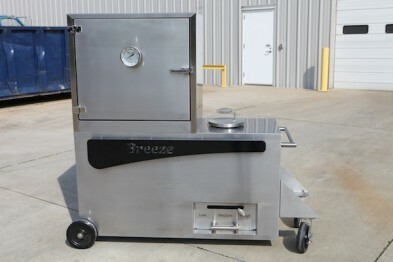 Hello all, I have some exciting pictures of the latest design of the Breeze. The biggest thing you’ll notice is the nameplate/towel rack we’ve added to the front. Now you can hang your towels and utensils while cooking with the Breeze! There are also a lot of small design changes that you probably don’t see, but contribute to the overall craftsmanship and quality of the unit. The bigger wheels are an added accessory, the standard unit comes with 2 smaller wheels. Enjoy!